Many moons ago, when I was a grad student at LSU Fisheries, I would often pitch in to help other grad students, as well as graduate associates, with their field projects. One of the big projects that put many students through grad school was on the Atchafalaya Basin. Students and assistants studied everything about the Basin’s biology; from its water chemistry (boring), to plankton (boring) to benthos, the critters that live in the mud (boring), to crawfish and river shrimp (pretty cool), to fish (really cool). I liked helping out on the fish projects. We killed (the term we used was “sacrificed”) a lot of fish to study them. Dugan Sabins, a research associate who I occasionally assisted, always checked the stomach contents of any fish he collected. I remember being amazed at the predominance of crawfish in the stomachs of those Atchafalaya Basin fish. 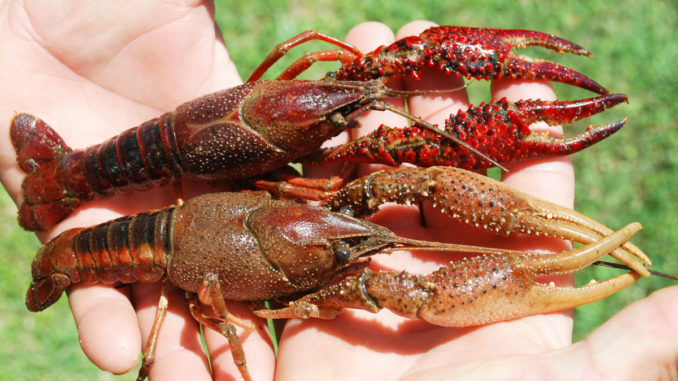 The sheer numbers of crawfish in the Basin (known as the “Spillway” to those who love to eat crawfish) is amazing, if only for the reason that Louisiana has the lowest number (39) of species of crawfish of all the southeastern states in the U.S. Some time ago, I had the privilege of hearing a presentation on the subject of crawfish in the diet of Atchafalaya Basin fishes at a meeting of the Louisiana Chapter of the American Fisheries Society. The presenter, Dr. Chris Bonvillain, now on the faculty of the Department of Biological Sciences at Nicholls State University, was a grad student in the same department at LSU when he gathered the data he presented. 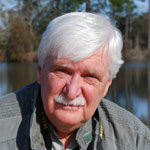 Crawfish are important to the Atchafalaya Basin ecosystem for a number of reasons, said Bonvillain. Naturally, they serve directly as food for fish of the Basin, but they do more. 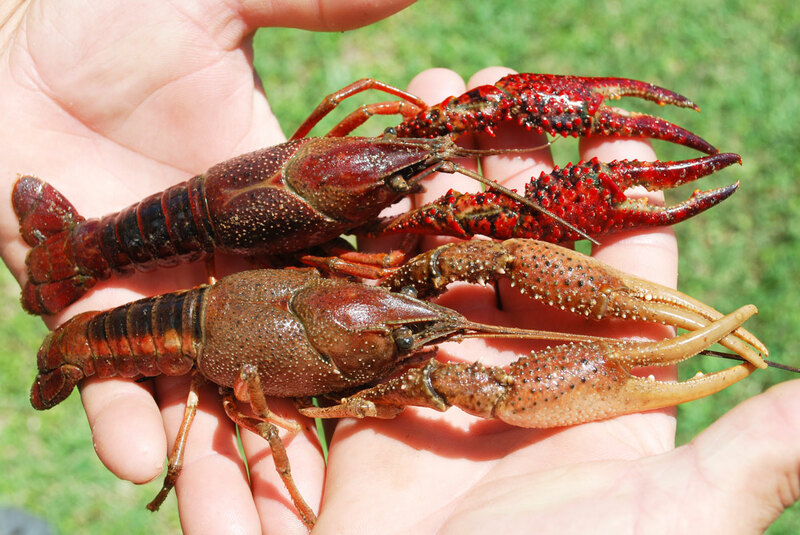 Red swamp crawfish (top) and white river crawfish are the predominant mudbug species in the Atchafalaya Basin. Most importantly, they cycle nutrients from detritus, the remains of plants and animals, mainly plant matter, from the soil (after flooding) and water bottoms up higher into the food chain. This includes not just crawfish, but the fish that sport and commercial fishermen love to catch. They eat some of the detrital material themselves, but they also shred the detritus, making it easier for decomposers to break the material down, making it available to other creatures. Crawfish are abundant and serve their role both at high-water periods, typically mid-winter to late spring when crawfish harvests in the Basin by humans are at their highest, and at low-water periods the rest of the year. The purpose of Bonvillain’s study was to examine the stomach contents of fishes in the southeastern part of the Basin to determine how many species of fish relied on crawfish in their diets. He collected the fish for the study by electrofishing, essentially shocking them up. The table shows the results of his work. Invertebrates are animals without backbones, so the category “Non-Crawfish Invertebrates” includes insects, as well as creatures such as grass shrimp and river shrimp. People obviously aren’t the only ones who love mudbugs. 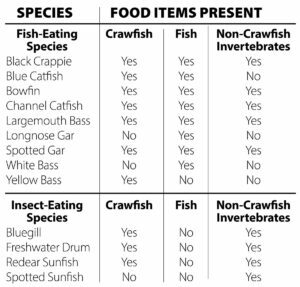 This table illustrates how important a role crawfish play in just about every fish species in the Atchafalaya Basin. Bowfin (choupique) had the highest percentage of crawfish in their diet at 95 percent, followed by spotted gar at 74 percent. 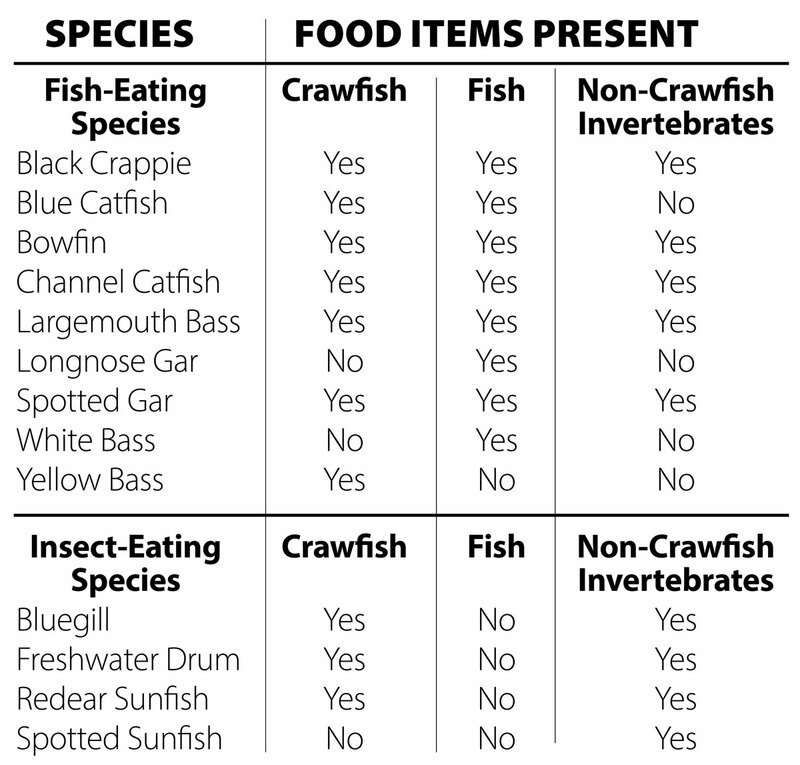 Crawfish and fish were found equally in 46 percent of largemouth bass stomachs, and a surprising 50 percent of bluegill stomachs contained mudbugs. For fish-eating fish, 64 percent of them ate crawfish, and 47 percent of insect-eating fish had crawfish in their stomachs, too. Black crappie, notorious fish-eaters, contained crawfish in only 24 percent of their stomachs, much less than for bass or bluegill; but still a surprisingly large number. What was surprising for black crappie was that nearly the same percentage of stomachs, about 50 percent, had non-crawfish invertebrates as had fish. Crappie are known for feeding heavily on the larvae of small flies called midges. Because crawfish populations are known to strongly spike during periods of high water, it would be easy to incorrectly assume that most, if not all the crawfish consumed by fish were eaten during high water. 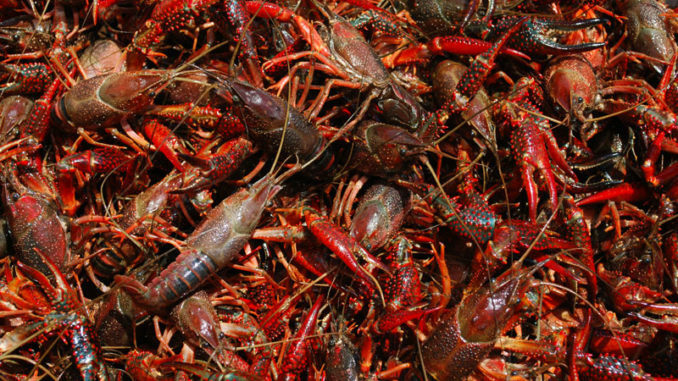 During spring high water flood periods, 79 percent of the fish collected had crawfish in their stomachs. But during low water periods, crawfish were still found in 58 percent of the samples. Bonvillain credits the role that crawfish play in the Atchafalaya Basin to the powerful spring river floods it receives annually. He compared it to the Barataria Basin, which stretches from Lake Des Allemands in the north down through Barataria Bay. Long cut off from the Mississippi River, it now depends (except for a couple of man-made diversions) totally on rainfall as a source of freshwater into the system. As a result, it does not experience the strong flood pulse of water each year that the Atchafalaya does — and it has very few crawfish. The dominance of crawfish in the diet of Atchafalaya Basin largemouth bass may partially explain the success of crawfish imitating jigs and soft plastic lures.